Syncing Mendeley Desktop with your Mendeley Web account will allow you to access your references from any computer or on the Mendeley app on your iOS device. When you open Mendeley on your computer, it will automatically sync with your web account. Otherwise, syncing must be initiated by clicking the Sync button in the toolbar along the top of Mendeley Desktop. With the free version of Mendeley, you have 2 GB of personal storage and 100 MB of group storage. To view available space, select Edit Settings at the top of the center panel in Mendeley Desktop or Account details from the My Account drop-down menu in the upper right corner of Mendeley Web. Dashboard: Displays activities that you, your group members, or any groups or people that you follow, do in Mendeley. My Library: Your Mendeley library. Papers: Search for papers in Mendeley's research catalog, which consists of anonymized records from users' libraries. Groups: Search for groups to follow or join. People: Search for people to follow, or view who is following you. Choose Edit my profile from the My Account drop-down menu in the upper right corner. Publications in the My Publications folder will be displayed in your profile. Other fields must be entered manually. Change the privacy setting for your profile by selecting Privacy from the My Account drop-down menu. This method of adding references to Mendeley works best for PDF files. Mendeley can extract data from a file to create a new reference. Always review the reference to ensure that all citation information has been added correctly. Add Files: Open Mendeley Desktop. Select the folder to which you wish to add a reference. Click the Add Files button in the upper left corner of the toolbar. Select the file that you wish to add and click Open. Drag and Drop: Drag and drop a file, or an entire folder, from your computer to the center panel in Mendeley Desktop. Watch Folder: Documents added to a designated Watch Folder will automatically be imported into Mendeley. Choose File > Watch Folder... from the menu bar. Navigate to a folder, check the box next to the folder, click Apply, then OK. The Mendeley Web Importer allows you to save references directly to your Mendeley account. This method works for some databases, such as PubMed and Google Scholar, and publisher websites. A list of supported sites can be viewed when installing the web importer. To install the web importer, choose Tools > Install Web Importer from the menu bar in Mendeley Desktop. From the page that opens, drag the Save to Mendeley button to your bookmarks toolbar. When viewing a list of results in a database, or a single article on a publisher's site, click the Save to Mendeley bookmark. Sign in to your Mendeley account, then select the references that you wish to add to your Mendeley library by clicking the plus sign next to each reference or Save all at the top of the list. The references will be added to your Mendeley Web account. In Mendeley Desktop, click the Sync button in the tool bar to bring the new references into your desktop library. The Mendeley Web Importer does not detect complete citation information for a list of results in some databases, so other methods are recommended when you wish to add multiple references at one time. For a single reference: Click on the title of the reference that you wish to add to your Mendeley library. Click the Save to Mendeley bookmark on your toolbar. For multiple references: Click the Add to Folder icon to the right of each reference that you wish to save. When you are ready to export your results to Mendeley, click on the Folder icon at the top of the page. In folder view, click on the Export link in the column on the right. Select Direct Export in RIS Format and click Save. A box will appear prompting you to either Open or Save the file that you are creating. Choose the Open with radio button and select Mendeley from the drop-down menu. If you do not see Mendeley in the list of options, then select Other and find Mendeley. Click OK. The references will appear in Mendeley Desktop. For multiple references: Check the boxes next to the references that you wish to save. Scroll to the Save to menu at the top of the search results page. Choose Save to Other File Formats. In the box that opens, select BibTeX from the File Format drop-down menu. Click Send. A box will appear prompting you to either Open or Save the file that you are creating. Choose the Open with radio button and select Mendeley from the drop-down menu. If you do not see Mendeley in the list of options, then select Other and find Mendeley. Click OK. The references will appear in Mendeley Desktop. Choose File > Add Entry Manually... from the menu bar (Desktop) or the Add Document button from the toolbar (Web). Select a Reference Type from the drop-down menu. Enter the citation information for your reference, as completely as possible, in the fields provided. Click Save. When you click on a reference, the details for that reference will be displayed in the right panel. You can edit the information, add tags, or attach a file to the reference. Click on Notes at the top of the panel to add notes and view annotations on attached documents. Folders are used to categorize and organize references. All Documents: All references in your library. Recently Added: References recently added to your library will remain in this folder for 3 weeks. Favorites: References that you have starred. My Publications: Place references that you have authored or co-authored in this folder. References in this folder will be displayed in your Mendeley profile. 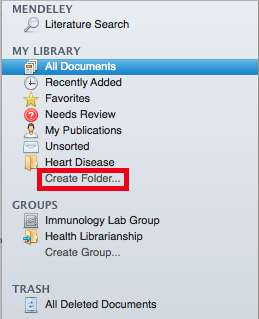 To create a new folder, click Create Folder.. (Desktop) or New Folder (Web) in the left panel of your Mendeley library. Enter a name for your folder. To create a subfolder, right-click on the folder to which you would like to add a subfolder, and select New Folder. Select a range of references by clicking the first reference, then press the Shift key and click the last reference in the range. Drag selected references and drop them in a folder. To remove a reference from a folder, select the reference(s) that you wish to remove, right click and select Remove from Folder. Drag and drop references to All Deleted Documents OR right click and select Delete Documents. When you are confident that you wish to permanently remove the references in the trash from your library, right click All Deleted Documents and select Empty Trash. In Mendeley desktop, check to see if the Word plugin has been installed by selecting Tools from the menu bar. If the Word plugin has NOT been installed, then you will see an option to Install MS Word Plugin. Prior to inserting citations, check for duplicate references in your Mendeley Desktop library. In the panel on the left, select All Documents to display all references in your library. From the menu bar, select Tools > Check for Duplicates. A list of duplicate references will be displayed. Review the references and choose the details that you would like to keep from each reference by selecting the check box next to each field. Then, click the Merge Documents button. Open your Word document. When you are ready to cite a source, place your cursor where you want to insert the citation. For Windows, click on the References tab, then choose Insert Citation from the Mendeley Cite-O-Matic panel. For Mac, click on the scroll icon, then Mendeley > Insert or Edit Citation. Alternatively, select View > Toolbars > Mendeley Toolbar to view the Mendeley tool bar in Word. Then, select Insert or Edit Citation from the toolbar. In the box that appears, enter text (author's last name, year, title, keyword, etc.) to search for references in your library. Select a reference, then either search for additional references or click OK.
You can also search for references from within your Mendeley library by clicking Go to Mendeley. In Mendeley Desktop, highlight the references that you wish to insert. To highlight multiple references, hold down the Ctrl or Command key while you click on references. Once you have selected your references, click the Cite button in the toolbar along the top. The selected references will be inserted into your document. Use Mendeley Citation Editor to add page numbers, supress author name, add to or delete a citation. Click on the citation in your document. 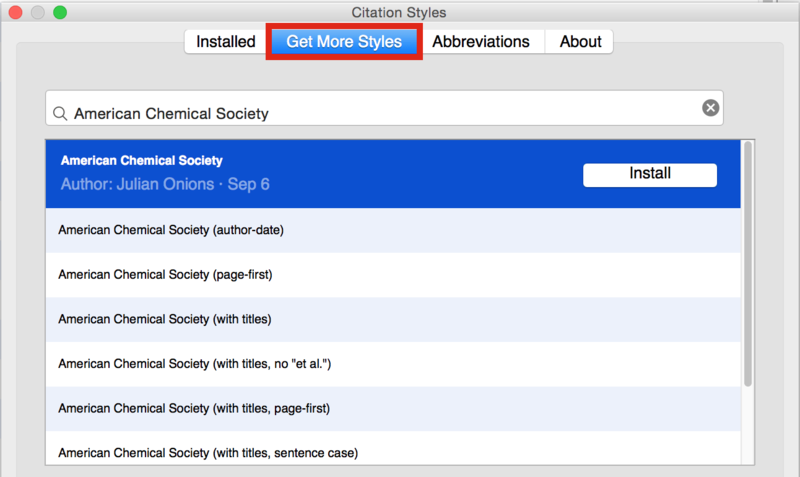 Then, select Edit Citations (Windows) or Insert or Edit Citations (Mac). In the box that appears, click on the citation that you wish to edit or delete, or search for additional citations. Place your cursor where you would like the bibliography to appear in your document. Output styles are templates that control the appearance of in-text citations, footnotes and bibliographies. 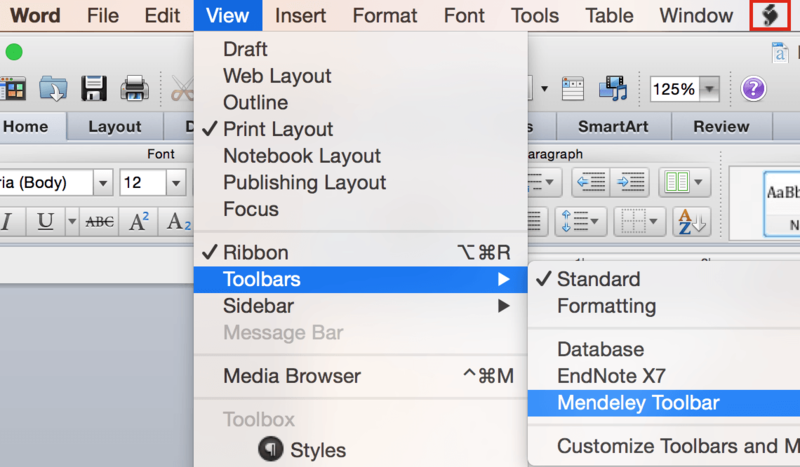 In your document, select an output style from the Styles drop-down menu in the Mendeley panel or toolbar. In the box that opens, click the Get More Styles tab. Search for your style by name. When you find your style, click Install. Private: Share references and documents with other Mendeley users who you invite to the group. Only groups members can see the group. Public, Invite-Only: Share references only. Any Mendeley user can follow the group, but only group members can add references. Public, Open: Share references only. Any Mendeley user can become a member or follow the group. With free version, limited to 1 private of up to 3 members, and 100 MB of shared web space. In the left panel of of Mendeley Desktop, click Create Group..., or in Mendeley Web, select the Groups tab, then click Create a new group button in upper right corner. Enter group name and description, and choose the type of group that you would like to create. Then, click Create group. Enter the email addresses of the people you would like to invite to your group. Drag and drop references, and attached documents (private groups only), from your Mendeley library to the group. Click the Sync button in the toolbar to share references and documents with group members. To add or remove members from a private or invite-only group, select the group, then click on the Members tab at the top of the center panel (Desktop) or left column (Web). To add a group member, enter the email address of the person who you would like to add in the box at the top of the page. To remove a group member, select Remove from group from the drop-down menu to the right of the name of the person who you would like to remove. Help guides and video tutorials from Mendeley. Need help with Mendeley? Contact us at Citation-Help-Group@brown.edu or check out the resources below. Search Mendeley's database of frequently asked questions, or post your own question.